Seekin' other sea-worthy sites? Lookin' to unearth some treasure? Check out these links to other websites and resources for more plunderin' fun, aye! Meet Margaret Kerry - the actress/model behind the sassy pixie Tinker Bell, and learn about her experiences working with Marc Davis and the animators that created Disney's classic "Peter Pan"
and both mourning and perfume jewelry. A fascinating re-creation of New Orlean's Square and the Pirates of the Caribbean attraction - in 3D. Buy men's and women's pirate costumes. Also find kids and children's pirate costumes. Find an amazing Jack Sparrow costume, too! A series of stop-motion short films about, er, zombie pirates. Fun! Humorous pirate videos, and more informationregarding pirate life and customs! The largest selection of pirate headwear to be found on the seven seas! Voted best tattoos in Los Angeles 2006 by CitySearch.com! Scott Weitz's "Theme Park for the Mind"
A celebration of Disneyland's "Adventure Thru Inner Space"
An Amusement Park - Theme Park Resource, providing the amusement park industry with the latest information about amusement park business, equipment & supply, design & construction. 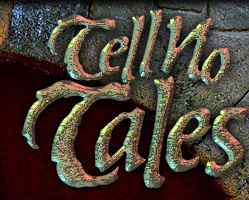 Want to link to TellNoTales.com? To display this banner on your own website, copy the code in the text box below and paste it into the html of your website, blog, or myspace page!